This week is the first-ever Fiji language week with the theme Noqu Vosa, Noqu iYau Talei: My Language, My Treasure. The Pacific Cultures curators have been blogging daily with Fiji related stories from the collections and exhibitions at Te Papa. 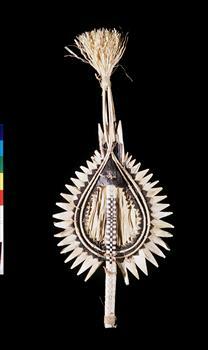 Today’s second to last blogpost is from Rachel Yates (Curator Pacific Cultures). The meke is an indigenous Fijian song/dance that is performed by both men and women in Fijian village settings or as part of the celebrations of a significant event. There are different types of meke some of which are called the meke ni valu (before a war), meke lavaki (reception of a chief) and meke ni vu (the telling of an origin story). Like many other Pacific Islands, music is woven into much of Fijian customs and way of life; it’s a powerful tool for transmitting knowledge. Meke lyrics and actions can include the detailing of historical events, explaining of natural phenomena and claimed by some to even predict the future. I have never seen a meke with both vakatara and matana performing live, but have been fortunate enough to witness this exciting dance twice in New Zealand. In both instances meke dancers were supported by an electronic vakatara, a backing track that featured a song and drumming that had been pre-recorded. 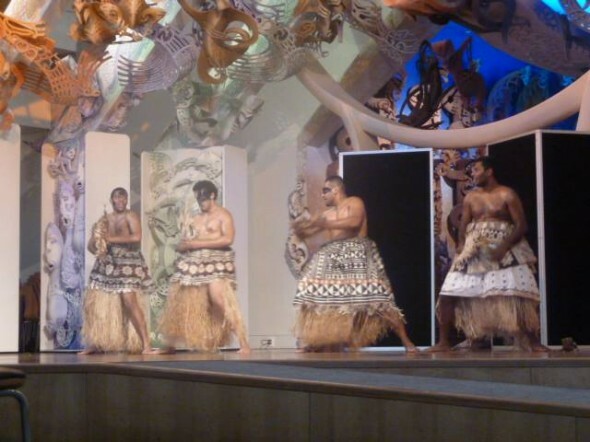 This second experience occurred just last week here at Te Papa when members of Victoria University’s Fiji Students Association performed as part of the build up to this week’s inaugural Fijian Language Week. 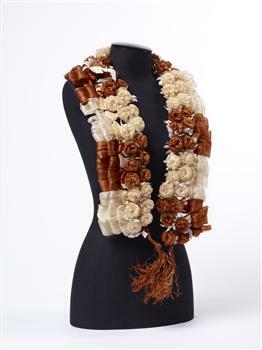 Te Papa Tongarewa’s Pacific Collection includes items that are familiar to meke performers, such as the salusalu (garlands of flowers) and iri ni meke (dance fans). 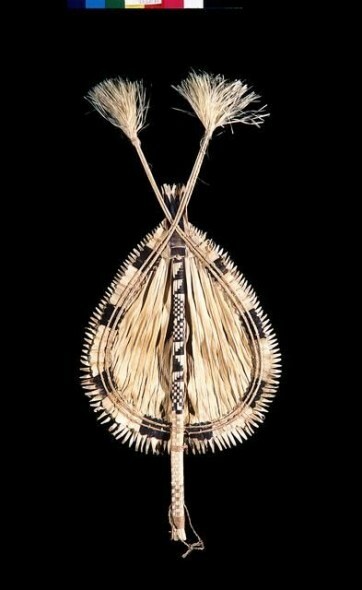 Performers may also wear costumes made of indigenous materials like masi (tapa cloth) and skirts of hibiscus fibre; other accessories can include moto (spears) and i wau (clubs) which are used to emphasize dance movements and the narrative of the performance. The Fijian meke has always been diverse and complex in indigenous Fijian society. The variety of Fijian populations and experiences, the interchanging of ideas, products and world views and the development of sectors like tourism in a 21st century Pacific, encourage change. Fijian cultural customs such as meke will inevitably become more diverse and complex as Fijians engage and contend with these modern factors as well as incorporate new stories to pass on to their communities. Kaisau, S. (1978) The functions of Fijian mekes. In Finnegan, R. & Pillai, R. (Eds.) Essays on Pacific Literature. (pp.20-31). Suva: Fiji Museum. 1. Where does the “vakamalolo” category of meke come in. Isn’t that where the performers are sitting down? 2. I am a bit disappointed in the mekes on YouTube. Those mekes were improvised for the sake of the tourists (or foreigners to the Fijian culture – like prostituting the Fijian culture). I have seen proper mekes performed around Fiji. Nothing at all like what is on YouTube.